Did you take this picture? If so, thanks! You have probably been asked that sometime, or have said it yourself to a stranger. If not, you may be spending too much time in your La-Z-Boy, because that exchange is common at tourist attractions all over the world. It is followed by brief instructions: “Just press this button.” “This one, right?” “That’s it.” Then the couple or group strikes a pose in front of the waterfall or museum or whatever. You snap the shutter, you hand the camera back, and you never see each other again. I’d like to believe that a photo I once took of a couple in Key West is a keepsake, but who knows? Maybe she didn’t think her hair looked good that day. I’d also like to know if the tourists in London who spoke no English ever had second thoughts. They had insisted on posing near Big Ben — with them facing in the opposite direction! I could not get them to stand with that famous landmark in their picture. Sally and I have handed our camera to strangers on quite a few occasions, with mixed results. In Paris, a gentleman made it look as though we were at the Leaning Tower of Eiffel. A young woman in San Francisco composed the shot in such a way that our bodies blocked the Golden Gate Bridge, which, I should have explained to her, was the reason for taking the picture. On our way to a show one night in New York, a uniformed security guard in Times Square stopped us and said, “give me your camera, I’ll take a picture of you two.” I try not to argue with armed men, so I not only handed over the camera, I didn’t protest when he demanded that I pose with my arms folded across my chest like I was the newly crowned heavyweight champion. Then he instructed Sally to drape herself over my shoulder and “look hot”. As you might imagine, the picture turned out… pretty well, actually. Once in a while, a stranger proves to be so skilled — or so lucky — that you wind up with a wonderful preserved memory (which, when you think about it, is what a snapshot is). Unfortunately, there’s no way to express your gratitude to the photographer, since you have no idea who they are. Still, I wish I could say “great job” to the person who took our photo at sunset on the Piazzale Michelangelo in Florence, and to the guy who framed the shot perfectly at Versailles. 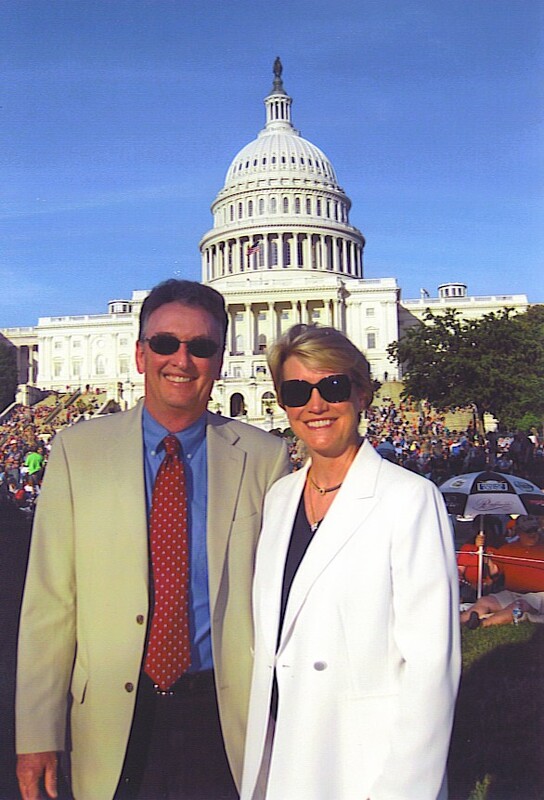 Then there was the man who took our picture at a Memorial Day event at the U.S. Capitol in Washington, D.C. His first attempt had cut off the top of the dome; Sally asked him to take another one, and he graciously did. The second try was outstanding, so — thank you, whoever you are. I hope you like the one I took of you. This entry was posted in Travel and tagged photography. Bookmark the permalink. Back before the days of digital cameras, my husband and I rode an elephant as part of a trek in Thailand. We asked someone to take a photo of us – but she neglected to include the elephant in the frame. We could be sitting anywhere! Console yourself with the thought that the shot might have been spoiled anyway — the elephant probably blinked. By the way, Jen, even though you certainly do not qualify as a stranger, thank you for the photo you took of us in front of the Sydney Opera House. It’s one of my favorite travel memories. Thoroughly enjoyed this entry! I love when people ask me to take their photo and I look at Adam and pass the camera right to him. I always say that they are much better off asking him than me. I consider it his civil duty to share a little of his profession in the public world of snapshots! We have a friend who, back in the 50’s, would take his camera to Grauman’s Chinese Theater in Hollywood and offer to take photos of the tourists posing next to their favorite celebrity’s hand prints. He’d dutifully take their name and address so he could send them their photo. He did quite well for himself. And had he had any film in his camera, I’m sure the tourists would have, too.